Note that not all SCCs in the CFG are necessarily loops. Definition at line 464 of file LoopInfo.h. Definition at line 391 of file LoopInfo.cpp. References llvm::dbgs(), and llvm::LoopBase< BasicBlock, Loop >::print(). Referenced by CheckMACMemory(), llvm::createLoopDeletionPass(), llvm::LoopDeletionPass::run(), shouldRotateLoopExitingLatch(), and llvm::UnrollRuntimeLoopRemainder(). Definition at line 393 of file LoopInfo.cpp. References assert(), llvm::LoopBase< BlockT, LoopT >::contains(), llvm::dbgs(), DFS(), E, first, llvm::LoopBase< BlockT, LoopT >::getParentLoop(), I, llvm::LoopInfo::LoopInfo(), llvm::LoopBase< BasicBlock, Loop >::print(), llvm::LoopBase< BlockT, LoopT >::removeChildLoop(), llvm::succ_begin(), and llvm::succ_end(). 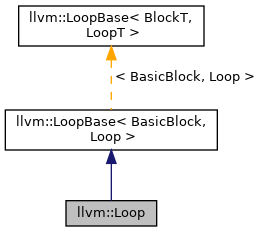 Check to see if the loop has a canonical induction variable: an integer recurrence that starts at 0 and increments by one each time through the loop. If so, return the phi node that corresponds to it. The IndVarSimplify pass transforms loops to have a canonical induction variable. Definition at line 138 of file LoopInfo.cpp. References llvm::MCID::Add, llvm::BasicBlock::begin(), llvm::LoopBase< BasicBlock, Loop >::getHeader(), getIncomingAndBackEdge(), llvm::PHINode::getIncomingValueForBlock(), H, and I.
Referenced by getInductionVariable(), and llvm::isUniformLoop(). Obtain the unique incoming and back edge. Return false if they are non-unique or the loop is dead; otherwise, return true. Definition at line 112 of file LoopInfo.cpp. References assert(), llvm::LoopBase< BasicBlock, Loop >::contains(), llvm::LoopBase< BasicBlock, Loop >::getHeader(), H, llvm::pred_begin(), llvm::pred_end(), and std::swap(). Return the source code span of the loop. Definition at line 357 of file LoopInfo.cpp. If this loop contains the same llvm.loop metadata on each branch to the header then the node is returned. If any latch instruction does not contain llvm.loop or if multiple latches contain different nodes then 0 is returned. Definition at line 227 of file LoopInfo.cpp. References llvm::LoopBase< BasicBlock, Loop >::getLoopLatches(), llvm::Instruction::getMetadata(), llvm::MDNode::getNumOperands(), llvm::MDNode::getOperand(), and llvm::LLVMContext::MD_loop. Referenced by AddRuntimeUnrollDisableMetaData(), llvm::addStringMetadataToLoop(), CloneLoopBlocks(), llvm::InnerLoopVectorizer::createVectorizedLoopSkeleton(), llvm::findOptionMDForLoop(), getLocRange(), GetUnrollMetadataForLoop(), HasAnyUnrollPragma(), isAnnotatedParallel(), llvm::LoopVectorizePass::processLoop(), llvm::LoopVectorizeHints::setAlreadyVectorized(), setLoopAlreadyUnrolled(), tryToUnrollAndJamLoop(), and tryToUnrollLoop(). Definition at line 593 of file LoopInfo.h. References llvm::LoopBase< BlockT, LoopT >::getHeader(). Referenced by asmClobbersCTR(), LoopFuser::fuseLoops(), llvm::DivergenceAnalysis::inRegion(), llvm::LoopDeletionPass::run(), llvm::SimpleLoopUnswitchPass::run(), llvm::LoopUnrollPass::run(), and llvm::LPPassManager::runOnFunction(). This looks for a BB terminating instruction with a known debug location by looking at the preheader and header blocks. If it cannot find a terminating instruction with location information, it returns an unknown location. Definition at line 355 of file LoopInfo.cpp. Referenced by llvm::LoopVectorizeHints::allowVectorization(), areLoopExitPHIsSupported(), llvm::LoopAccessInfo::blockNeedsPredication(), llvm::computeUnrollCount(), containsSafePHI(), llvm::createLVMissedAnalysis(), llvm::LoopVectorizationRequirements::doesNotMeet(), getDebugLocString(), getInductionVariable(), isProfitableForVectorization(), llvm::LoopVectorizePass::processLoop(), llvm::UnrollAndJamLoop(), llvm::UnrollLoop(), and warnAboutLeftoverTransformations(). Definition at line 63 of file LoopInfo.cpp. References llvm::all_of(), isLoopInvariant(), and llvm::User::operands(). Referenced by ConvertToSInt(), llvm::hoistRegion(), llvm::LoopPredicationPass::run(), shouldRotateLoopExitingLatch(), sinkLoopInvariantInstructions(), llvm::sinkRegion(), and llvm::InnerLoopVectorizer::widenInstruction(). A parallel loop can be assumed to not contain any dependencies between iterations by the compiler. That is, any loop-carried dependency checking can be skipped completely when parallelizing the loop on the target machine. Thus, if the parallel loop information originates from the programmer, e.g. via the OpenMP parallel for pragma, it is the programmer's responsibility to ensure there are no loop-carried dependencies. The final execution order of the instructions across iterations is not guaranteed, thus, the end result might or might not implement actual concurrent execution of instructions across multiple iterations. Definition at line 280 of file LoopInfo.cpp. References assert(), llvm::LoopBase< BasicBlock, Loop >::blocks(), llvm::SmallPtrSetImpl< PtrType >::count(), llvm::drop_begin(), llvm::findOptionMDForLoop(), getLoopID(), I, llvm::SmallPtrSetImpl< PtrType >::insert(), llvm::isValidAsAccessGroup(), llvm::LLVMContext::MD_access_group, llvm::LLVMContext::MD_mem_parallel_loop_access, and llvm::MDNode::operands(). Definition at line 189 of file LoopInfo.cpp. References llvm::all_of(), llvm::LoopBase< BasicBlock, Loop >::blocks(), and isBlockInLCSSAForm(). Referenced by analyzeLoopUnrollCost(), ConvertToSInt(), llvm::createLICMPass(), llvm::deleteDeadLoop(), deleteLoopIfDead(), FindLIVLoopCondition(), and llvm::UnrollLoop(). Definition at line 57 of file LoopInfo.cpp. References llvm::LoopBase< BasicBlock, Loop >::contains(), and I.
Referenced by llvm::PredicatedScalarEvolution::areAddRecsEqualWithPreds(), areLoopExitPHIsLoopInvariant(), calculateIterationsToInvariance(), llvm::canSinkOrHoistInst(), collectHomogenousInstGraphLoopInvariants(), ConvertToSInt(), llvm::createFalkorMarkStridedAccessesPass(), llvm::createLICMPass(), llvm::createSeparateConstOffsetFromGEPPass(), llvm::InnerLoopVectorizer::fixFirstOrderRecurrence(), llvm::InnerLoopVectorizer::getBroadcastInstrs(), getFalkorUnrollingPreferences(), getInductionVariable(), llvm::InnerLoopVectorizer::getOrCreateScalarValue(), GetPointerOperand(), llvm::getStrideFromPointer(), llvm::AMDGPUTTIImpl::getUnrollingPreferences(), hasLoopInvariantOperands(), llvm::hoistRegion(), isSafeToExecuteUnconditionally(), isSameUnderlyingObjectInLoop(), llvm::isUniformLoop(), makeLoopInvariant(), llvm::LoopPredicationPass::run(), llvm::LoopDataPrefetchPass::run(), unswitchBestCondition(), unswitchTrivialBranch(), unswitchTrivialSwitch(), and llvm::InnerLoopVectorizer::widenInstruction(). Return true if the Loop is in the form that the LoopSimplify form transforms loops to, which is sometimes called normal form. Definition at line 205 of file LoopInfo.cpp. References llvm::LoopBase< BasicBlock, Loop >::getLoopLatch(), llvm::LoopBase< BasicBlock, Loop >::getLoopPreheader(), and llvm::LoopBase< BasicBlock, Loop >::hasDedicatedExits(). Referenced by analyzeLoopUnrollCost(), llvm::canPeel(), countToEliminateCompares(), LoopFuser::fuseLoops(), INITIALIZE_PASS(), isLoadConditional(), llvm::isSafeToUnrollAndJam(), isSimplifiedLoopNest(), llvm::LoopVersioning::LoopVersioning(), mayUsePostIncMode(), ReduceLoopStrength(), tryToUnrollAndJamLoop(), tryToUnrollLoop(), llvm::UnrollAndJamLoop(), llvm::UnrollRuntimeLoopRemainder(), and unswitchLoop(). Definition at line 196 of file LoopInfo.cpp. References llvm::all_of(), llvm::LoopBase< BasicBlock, Loop >::blocks(), llvm::LoopInfoBase< BlockT, LoopT >::getLoopFor(), and isBlockInLCSSAForm(). Referenced by ConvertToSInt(), llvm::createLoopSimplifyPass(), formLCSSAOnAllLoops(), llvm::FunctionToLoopPassAdaptor< LoopPassT >::run(), llvm::LPPassManager::runOnFunction(), separateNestedLoop(), llvm::simplifyLoop(), llvm::UnrollAndJamLoop(), and unswitchLoop(). Definition at line 212 of file LoopInfo.cpp. References llvm::LoopBase< BasicBlock, Loop >::blocks(), and I.
Referenced by EqualityPropUnSafe(), and llvm::UnrollLoop(). If the given value is an instruction inside of the loop and it can be hoisted, do so to make it trivially loop-invariant. Return true if the value after any hoisting is loop invariant. This function can be used as a slightly more aggressive replacement for isLoopInvariant. If InsertPt is specified, it is the point to hoist instructions to. If null, the terminator of the loop preheader is used. Definition at line 67 of file LoopInfo.cpp. Referenced by FindLIVLoopCondition(), isLoopDead(), makeLoopInvariant(), and simplifyOneLoop(). If the given instruction is inside of the loop and it can be hoisted, do so to make it trivially loop-invariant. Return true if the instruction after any hoisting is loop invariant. This function can be used as a slightly more aggressive replacement for isLoopInvariant. Definition at line 74 of file LoopInfo.cpp. References llvm::Instruction::dropUnknownNonDebugMetadata(), llvm::LoopBase< BasicBlock, Loop >::getLoopPreheader(), llvm::BasicBlock::getTerminator(), llvm::Instruction::isEHPad(), isLoopInvariant(), llvm::isSafeToSpeculativelyExecute(), makeLoopInvariant(), llvm::Instruction::mayReadFromMemory(), llvm::Instruction::moveBefore(), and llvm::User::operands(). Add llvm.loop.unroll.disable to this loop's loop id metadata. Remove existing unroll metadata and add unroll disable metadata to indicate the loop has already been unrolled. This prevents a loop from being unrolled more than is directed by a pragma if the loop unrolling pass is run more than once (which it generally is). Definition at line 269 of file LoopInfo.cpp. References Context, llvm::MDString::get(), llvm::MDNode::get(), llvm::BasicBlock::getContext(), llvm::LoopBase< BasicBlock, Loop >::getHeader(), getLoopID(), llvm::makePostTransformationMetadata(), and setLoopID(). Referenced by CloneLoopBlocks(), tryToUnrollAndJamLoop(), and tryToUnrollLoop(). The LoopID metadata node will be added to each terminator instruction in the loop that branches to the loop header. The LoopID metadata node should have one or more operands and the first operand should be the node itself. Definition at line 251 of file LoopInfo.cpp. References assert(), llvm::LoopBase< BasicBlock, Loop >::blocks(), llvm::LoopBase< BasicBlock, Loop >::getHeader(), llvm::MDNode::getNumOperands(), llvm::MDNode::getOperand(), H, llvm::LLVMContext::MD_loop, llvm::Instruction::setMetadata(), llvm::Successor, and llvm::successors(). Referenced by AddRuntimeUnrollDisableMetaData(), CloneLoopBlocks(), llvm::InnerLoopVectorizer::createVectorizedLoopSkeleton(), DisableAllLoopOptsOnLoop(), llvm::LoopVectorizePass::processLoop(), llvm::LoopVectorizeHints::setAlreadyVectorized(), setLoopAlreadyUnrolled(), tryToUnrollAndJamLoop(), and tryToUnrollLoop(). Definition at line 604 of file LoopInfo.h. Definition at line 603 of file LoopInfo.h.